January 26 is celebrated as Australia Day. HMAS Stuart (FFH 153), the sixth Anzac Class Guided Missile Frigate is presently on deployment in the Gulf of Oman, carrying out counter terrorism and counter narcotic smuggling operations. 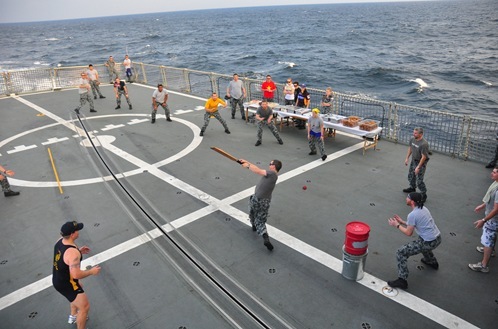 The crew celebrated Australia Day at sea by playing cricket on the flight deck. On completion of the match, the crew had a steel deck barbecue dinner by witnessing Arabian sunset. The crew also collected $700 as charity and the proceeds will be donated to Gran’s Van, a food van based in Burnie Tasmania which provides meals to the homeless and needy. Here is a photograph from Department of Defence, Australia. View more photographs from Image Gallery of DoD. For more information, log on to Australia Day. Read more from DoD, Media Release.